Here's a sign from Milwaukee, USA from one our readers in... not surprisingly... Milwaukee. 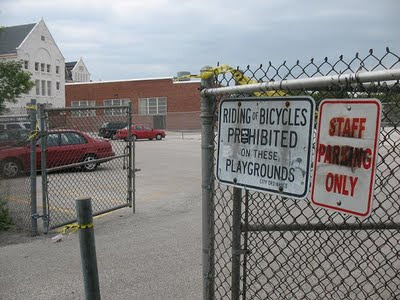 As he says: "Unfortunately, a school's playground in Milwaukee seems very non-Copenhagenize-y. Notice they allow cars on the playground, though, because THAT'S safe. Gotta get 'em hooked on autos while they're young!" I'm counting five bulls in that china shop, at least. Nice. Not. 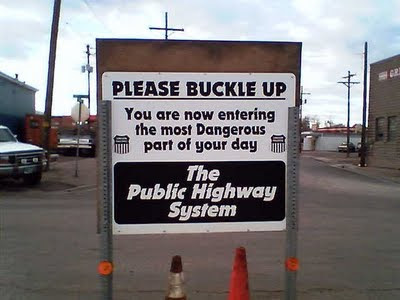 But here's a sign that is a little more logical. This time from Cheyenne, Wyoming, USA. Thanks to both readers for the photos!